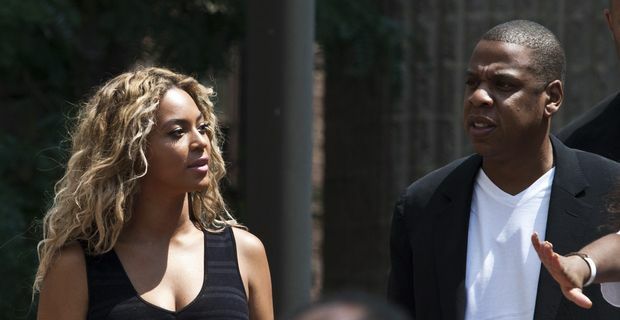 Jay Z and Beyonce appeared on stage in New York at a rally to protest about the clearing of George Zimmerman for the murder of black teenager Trayvon Martin. The issue has stirred widespread anger in the USA with protests in more than 100 cities. Zimmerman shot the unarmed teenager in February 2012. A Florida jury accepted that Zimmerman had acted in self-defence, using the controversial "stand your ground" defence law that is in force in Florida and some other states. The Reverend Al Sharpton addressed the crowd in New York, saying, "We are not coming out with violence, we are coming to denounce violence. Jay Z told me, 'I'm a father. Beyonce is a mother.' We all feel the pain and apprehension -- the laws must protect everybody, or it doesn't protect anybody. We do not come from hate, we come from love of children." Sharpton said the stars did not want to speak, and had not come for a photo-opportunity, although they have made their support for the cause overt in recent comments during performances. Reporters were also surprised that President Obama was prepared to personalise the issue. Speaking at a press conference, the President said: "When Trayvon Martin was first shot, I said that this could have been my son. Another way of saying that is Trayvon Martin could have been me, 35 years ago." He spoke about his own experience of being under suspicion merely for the colour of his skin. "If a white male teen was involved in the same kind of scenario, both the outcome and the aftermath might have been different," Obama asserted. It's an issue that has exposed a widespread belief that American courts are heavily weighted against African-Americans. The "Justice For Trayvon" movement could turn out to be a watershed moment for the US judicial system.